The Daintree Rainforest is located a 2 hour drive north of Cairns along one of the most beautiful coastal roads in Australia. This National Park and World Heritage Site is part of the unique Wet Tropics area and encompasses an area of approximately 1,200 square kilometres, from the Daintree River north to Cooktown. The Cape Tribulation section of Daintree National Park represents where two spectacular World Heritage sites meet - the Daintree Rainforest and the Great Barrier Reef. The rainforest is the ideal place to reconnect with nature, turn your phone and email off and simply enjoy lifes pleasures of what this natural playground has to offer. Accommodation ranges from simple beach cabins to all out luxury beach houses. There are many activities on offer including bush walking, kayaking, horse riding treks, snorkelling, exotic fruit tastings, zip lining through the rainforest canopy and 4WD safaris. 2. The Best way to see Crocs! Enjoy a cruise on the beautiful Daintree River and spot wildlife such as frogs, snakes, birds and estuarine crocodiles in their natural environment.Tours range from one hour to full day specialised cruises. River guides are well informed naturalists and biologists who generally include a commentary about the area and the mangrove ecosystem. The vessels are designed to allow visitors excellent viewing and comfort. Spend a night in ultimate luxury at Silky Oaks Lodge located in an unrivalled riverside location on the beautiful Mossman River, just downstream from Mossman Gorge. Guests can enjoy private rainforest walks, canoe rides, billabong swimming, spa treatments and world class cuisine. The Treehouse Restaurant is one of North Queensland's premier dining experiences and the open-sided restaurant offers sensational daintree rainforest and Mossman river views. Guests who are not staying at the resort are welcome to dine, bookings are essential. 4. Take a glimpse at the most varied scenery in FNQ! Daintree Village was originally a settlement created in the 1870's by timber-cutters, today low-impact tourism and sustainable cattle and tropical fruit farming in the beautiful valleys beyond the Village form the lifeblood of this quaint rural village. Hosting a handful of restaurants, artists' studios, locally-created souvenirs and picnic areas, Daintree Village prides itself with some of the loveliest and most varied scenery in Far North Queensland. 5. Run in a human sized hamster wheel!! The Daintree River Ferry is a cable ferry across the Daintree River and is the only cable ferry operating within tropical Australia. Operating daily from 6:00am until midnight, the ferry provides access to the northern section of the Daintree National Park, Cape Tribulation and beyond. It takes about fives minutes to cross the river. At busy times, for example during school holidays, some delays can occur waiting to cross the ferry. A toll is charged for the crossing. 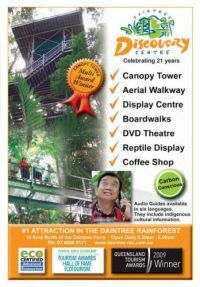 The Daintree Discovery Centre is located in the heart of the rainforest, just 10 kilometres north of the Daintree River. This award-winning world class interpretive facility that allows visitors to experience the rainforest at every level - from the forest floor to the upper most reaches of the canopy. Ideal for all ages, the interactive computer kiosks have animated DVD's are a great hit with the kids and the creek ecology display has fish, frogs and turtles and a reptile display. 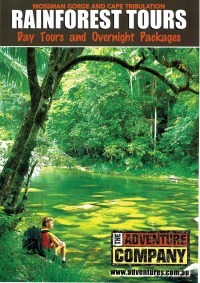 Gain entry into the most primitive sections of the Daintree Rainforest with Cooper Creek Wilderness. Hidden away from mass tourism, Cooper Creek Wilderness provides exclusive access for visitors to experience this living museum. Trails are off the beaten track where you can appreciate the beauty of fan palm galleries and find extraordinary fauna and flora. 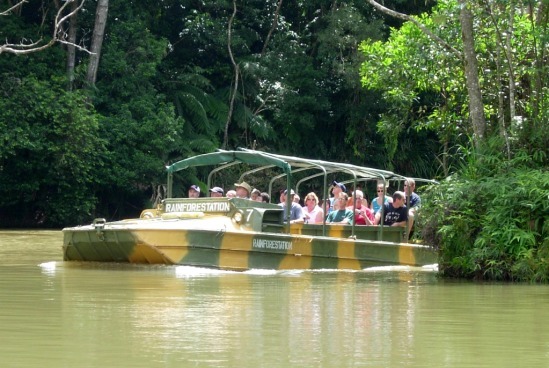 Join the ONLY TOUR BOAT permitted in the Cape Tribulation section of Daintree National Park. Wind your way from Cooper Creek’s Coral Sea mouth towards Queensland’s third highest mountain, Thornton Peak, on a leisurely & informative cruise into this unique world of mangroves. Cooper Creek is unspoiled by development and a perfect picture of prehistoric times. A wild environment, crocodile sightings are not guaranteed but participate in the hunt! Floravilla is a boutique ice creamery producing biodynamic/organic icecream from many exotic fruits. Flavours range from Plain Jane vanilla to crazy flavours like Sweet potato and Ginger, mango & goji berry, candied ginger & fresh turmeric...Yum! Go on have a go! $5 a tub with a little spoon and they welcome you to sit in the little garden where butterflies hang out, it's just one of the many special places to visit in the Daintree. The Jindalba Boardwalk is the first of Cape Tribulation Walks and is located 12 kms north of the Daintree River. Jindalba (meaning 'foot of the mountain') is the local Kuku Yalanji people’s name for this area. This is a peaceful rainforest boardwalk suitable for all levels of fitness. The walk is a 700 metre loop that winds around a hill and across a small creek, wheelchair access to the creek is from the exit end only. From the elevated boardwalk you look down into rainforest including king ferns and fig trees. Interpretive signs along the length of the boardwalk explain what you are seeing. Welcome to the unique World of insects! 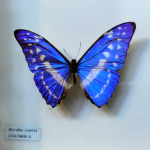 One of the worlds best private Butterfly and Beetle collections, this remarkable Museum houses a collection of rare and local Butterflies, Moths and Beetles, and has taken over 40 years to establish. Featuring personal artwork, breeding houses, live insects, and new local discoveries, the museum itself was created and hand built from beautiful rainforest timber on the property. Located 17kms north of the Daintree river ferry, you cant miss the large spider web gates. The Daintree Eco Lodge offers a true rainforest experience combining nature, nurture & culture. Accommodation comprises of just 15 "Bayans" (rainforest houses) nestled in the rainforest. Daintree Eco Lodge & Spa has placed emphasis on authentic indigenous experiences; take a walk with a local Aboriginal guide up to the lodges' waterfall, try a dot painting class and learn about the amazing plant, bird and wildlife surrounding you. Experience the romance of elegant tropical dining in the rainforest, just 10 minutes from Port Douglas. Explore the magic of time, culture and cuisine in the spellbinding, candlelit, enchanted rainforest. Flaming torches light the way and suddenly you are at a beautiful outdoor dining room draped in black velvet and silk with crystal bud-light chandeliers. This Rainforest Dining Experience will transport you into a world beyond your imagination. 15. Get up close and personal with the jungle and its inhabitants! Get off the grid, get into the green zone and experience the Daintree Rainforest up close and personal! Whether you are travelling by yourself, with friends, or the whole family, you can get a real taste of the jungle at Crocodylus. Safari style huts are nestled deep within the rainforest. Surround your senses with the sights, sounds, and smells of the Daintree - no air conditioners or manicured lawns in sight - just the real jungle! Journey through the World Heritage-listed rainforest on the famous Bloomfield Track, a true 4WD track full of spectacular views, creek crossings, secluded beaches, steep climbs and unexpected wildlife. Join an Aboriginal guide for a local perspective on the Bloomfield area, sharing a deeper significance of the land and its values to the local Kuku Yalanji people. Have a refreshing dip with lunch at Cape Tribulation. Mason’s includes a Tourist Information Centre, bottleshop and grocery store and cafe. The cafe is known for its spectacular collection of exotic 'road kill' burgars such as camel, crocodile, emu and kangaroo. Just next to this cafe is the crystal clear 'croc-free' swimming hole in Myall Creek, and there is a deck and licensed bar area overlooking the rainforest and Mount Hemnant. 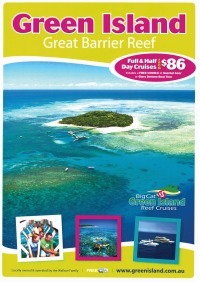 Paddle out into the Great Barrier Reef from where you can observe a spectacular backdrop of the Daintree National Park. Kayak around the beautiful Cape Tribulation headland to see where the two World Heritage areas of the Daintree rainforest and the Great Barrier Reef meet. 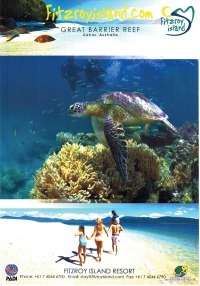 This is the ultimate way to explore tropical beaches, fringing reef, mangroves and Marine wildlife. The only horse riding available in the Cape Tribulation area. Enjoy the breathtaking Cape Tribulation scenery as you meander your way through the oldest living rainforest in the world. Ride through crystal clear mountain streams, through paddocks and along riverbeds until you reach the spectacular Cape Tribulation Beach. Ride along the ocean edge on horseback before stopping at a private swimming waterhole for a refreshing swim. Whet Cafe, Bar & Restaurant is the epicentre of dining and entertainment in Cape Tribulation. Set amongst beautiful and untouched tropical Daintree rainforest. With beautiful outdoor deck dining, an attractive lounge area, cinema, and icy cold beer - Whet is the place to eat, drink, hang out and enjoy. Journey beyond Cape Tribulation with Billy Tea Bush Safaris. This the only tour operator to continue along the 4WD Bloomfield Track through to Emmagen Creek. Here you can enjoy a refreshing fresh water swim in crystal clear waters and sample a cup of traditional Billy Tea, made in a traditional Australian Billy. 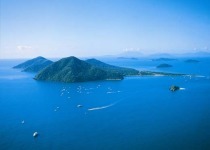 Located about 5 kilometres north of Cape Tribulation. A Giant Strangler Fig about 800 metres south of Emmagen Creek marks the start of a rough track which leads to Emmergen Beach. It is possible to walk back along the coast to Cape Tribulation Beach, if it is low tide. Do not attempt to swim as a crocodiles frequent the area. Lync Haven Wildlife Experience is set amongst 20 acres of beautiful rainforest, offering a unique experience where you can see snakes, crocodile and lizards up close, feed kangaroos & swamp wallabies. Inhouse guests and visitors are welcome to enjoy the animals (gold coin donations are appreciated). Stay and enjoy a meal, open for breakfast, lunch and dinner 7 days a week. You truly cannot appreciate the majesty of the reef and rainforest until you've seen it from the air. Experience the vastness, the beauty and the unbelievable scenery that you just don’t see from the ground. A 20 minute scenic heli flight offers spectacular views of the majestic virgin rainforest up to the palm fringed beaches of Cape Tribulation, plus awesomes views of where the rainforest meets the Great Barrier Reef. Possibly sight a croc, turtle, dugong and various other marine life. Mossman is the place to go to discover the culture of the Kuku Yalanji people, Indigenous Australians who are also known as "Rainforest People". Sign up for a Dreamtime Walk led by a Kuku Yalanji member and learn about dreamtime legends, traditional plant use, local bush tucker and the relationship between the Kuku Yalanji and the rainforest environment. Much of Cairns and its surrounding region is located in the Wet Tropics World Heritage Area, making way for some of the most amazing scenery and sights. Clear cascades, flowing streams, waterfalls and gorges provide diverse natural wonderlands. Cairns’ greatest asset is its proximity to some of the most amazing natural attractions, making it the perfect entry point for your tropical adventure. An amazing 600 tour options are available each and every day from Cairns offering a variety of natural and cultural experiences. 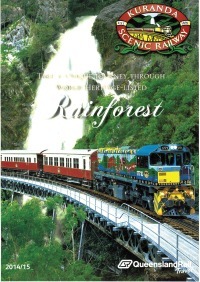 Rainforest sights can also be easily reached by train, cable car, car, bicycle, local bus or on foot.. 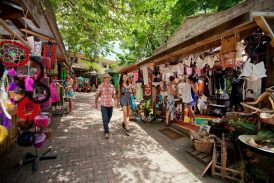 Located in World Heritage Rainforest, 1,000 feet above Cairns, the village of Kuranda is renowned for its delightful mix of village shops, world-famous markets, colourful characters and natural beauty. Take a stroll through this 'village in the rainforest', it is one of Tropical North Queensland's must-see destinations. The Barron Gorge National Park is located just 10 minutes from Cairns City and considered one of the most picturesque national parks in Queensland. Boasting rugged mountain ranges, steep ravines and gorges, tumbling waterfalls, rich rainforest and meandering freshwater streams. This 2820 hectare national park provides a spectacular example of Australia's World Heritage listed tropical rainforests. Fitzroy Island is one of the most unspoiled islands on the Great Barrier Reef, located just a 45 minute ferry transfer from Cairns. The majority of Fitzroy Island is National Park which includes mangroves, open woodland, tropical pristine rainforest and coral beaches, best experienced by the walking trails around the island. Both the Secret Garden track and Nudey Beach track wind through sheltered rainforest and around huge granite boulders. The Flecker Botanic Gardens is the only wet tropic botanic gardens in Australia, located just 5 kilometres from the city centre. Explore the beauty of tropical plants and encounter rainforest species first hand. For those who enjoy a walk, Fitzalan Gardens adjacent to the Flecker Botanic Gardens, features tropical gardens connected by interesting paths and footbridges. Attached to the Botanic Gardens is the Gondwanan Heritage Trail that traces the evolution of plants from the first photosynthetic bacteria to the modern flowering plants. Few places on earth contain so many plants and animals which remain relatively unchanged from their ancestors in the fossil record. This outstanding example of the Earth’s evolutionary history is divided into zones, representing different stages of the 415-million-year plant evolution. There is also an explanatory brochure at the start of the trail and from the Visitor Centre. The original Kuranda Scenic Railway is a spectacular journey comprising unsurpassed views of World Heritage Listed rainforest, steep ravines and picturesque waterfalls within the Barron Gorge National Park. This famous railway winds its way from Cairns to Kuranda, the village in the rainforest. Constructed between 1882 and 1891 it is considered an engineering feat of tremendous magnitude. 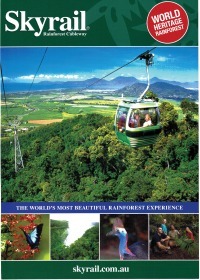 Explore the wonders of an ancient tropical rainforest from above and below on the Skyrail Cableway Experience. Spanning 7.5kms over pristine tropical rainforest, the Skyrail journey will immerse you in an intimate rainforest experience where you’ll see, hear, smell and become part of the tropical rainforest environment. Glide just metres above the rainforest canopy in a six person gondola, before descending through the canopy layers and deep into the heart of the forest. The Djabugay Aboriginal Guided tours at Barron Falls Skyrail Station provides a fascinating insight into the Aboriginal history, language, culture, stories and traditions of the indigenous rainforest people through a personalised, small group walking tour. Walk in the footsteps of the Djabugay people, marvel at the traditional bush foods, shelters and Aboriginal history of the rainforests. Take a visit to the lower Barron Falls in wet season after a good downpour and feel the energy of the rapids as the wet season floodwaters create a spectacular sight.The lower section of Barron Gorge National Park can be accessed from Kamerunga and Lake Placid. Drive along the scenic Barron Gorge Road to the Barron Gorge Hydro-Power Station. Surprise Creek Falls is located near the Barron Gorge Hydro and cascades 243 metres (797 ft) into the gorge. Tucked away at the bottom of the Gillies Range is stunning Little Mulgrave Valley. Situated west of Gordonvale follow the Gilles highway towards the Atherton tablelands and take the first right at the bottom of the range just before the Mountain View Hotel. This beautifully quiet location offers stunning crystal clear refreshing freshwater creeks, very safe and no crocodiles here. Cattana wetlands is an enjoyable 80ha nature conservation park with a 420m boardwalk through feather palm forest, freshwater and salt water lakes with abundant plant and birdlife. The land has been rehabilitated to protect the 30 hectares of lowland rainforest on the western end of the site. This forest, described as the Feather Palm Forest, is a remnant of a once extensive forest type that is now confined to only a few remnant patches in the Cairns region. The ancient coral cay of Green Island is a very unique indeed. Out of the 300 sand cays on the Great Barrier Reef it is the only one with a rainforest. Located just a short 45 minute ferry ride, Green Island is easily accessible for a day trip or stay overnight and relax in luxury resort accommodation. Pick up a Self-Guided Eco Walk booklet from the Information Centre and explore the rainforest and wildlife at your own pace. The two linked circuit walks on the rainforest-clad slopes of the Whitfield Range offer convenient recreational opportunities for enthusiastic joggers and walkers. Only 5km from the city centre, the popular Red Arrow Circuit passes through an arch of the towering fishpole bamboo, and climbs through shady rainforest gullies and dry open forest to an open viewing areas overlooking the city and towards the airport. The Blue Arrow circuit starts about half way around the Red Arrow circuit and is 5.4km. The track begins with a steep 600 m climb to a lookout with views of the coast north of Cairns and a glimpse of Lumley Hill. The circuit can be walked in either direction. The right branch passes through rainforest and open grassland before climbing steeply towards Lumley Hill. The left branch climbs through rainforest on stairs created by the roots of rainforest trees. Nestled below the rugged Bellenden Ker Range, Goldsborough Valley’s lush lowland rainforest and the picturesque Mulgrave River offer opportunities for canoeing, mountain biking, walking and camping in the Wet Tropics World Heritage Area.Learn more about Aboriginal culture on the Wajil walk (a short walk to the base of Kearneys Falls). Walk or mountain bike in the footsteps of early prospectors on the historic Goldfields trail. Enjoy canoeing in the picturesque Mulgrave River or camp and enjoy the natural area. Goomboora Park is a great place for a family picnic and excursion, especially for those who are looking for quiet and natural spots. The park is surrounded by a beautiful freshwater creek and rainforest with plenty of enjoyable rainforest walking paths. There is plenty of wide open space, large trees and shelter for shade, as well as picnic tables, freshwater swimming and a new adventure playground that features a flying fox and a rope play system. A popular recreation walk, Glacier Rock is accessed via the Douglas Track commencing at Stoney Creek. Climbing steadily through rainforest, the track provides views to the east over Cairns and the Barron River delta and to the west over the rainforest-clad Barron River gorge. The highest point on the Douglas track, Glacier Rock, rewards energetic visitors with a spectacular panoramic views over Stoney Creek gorge to Mt Whitfield, Cairns and the coast. Looking for some mountain bike adventures? The Smithfield Regional Park provides a spectacular rainforest network of trails with some of the most fun-filled climbs and descents in the country for mountain bike riders. Trails sculpted out of volcanic clay twist their way through magnificent vine-wrapped jungles. Trail markers line the trails with green for the easy trails, blue for intermediate and black and black diamond trails for the technical and advanced trails. 25. Wet season WOW factor! 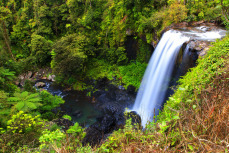 The Atherton Tablelands is a land of beautiful lakes, waterfalls, rich red soil and remnants of tropical rainforest. Many of the small remnants of tropical rainforest which once covered the Atherton Tablelands are now protected as national parks. Popular rainforest attractions include the Curtain Fig Tree, Millaa Millaa Falls, crater lakes and Mount Hypipamee Crater. Lambs Head, also known as Kahlpahlim Rock, is considered one of the best walks in North Queensland. It presents a challenging adventure ideally suited to experienced walkers and those with a good level of fitness. The track rises steeply through woodland and rainforest, and winds up and around massive boulders and pristine high altitude rainforest. It is well worth reaching the summit at around 1300 metres above sea level, the views are absolutely spectacular, overlooking Copperlode Dam and the ranges below and then further down to Cairns, Trinity Inlet and the sea. 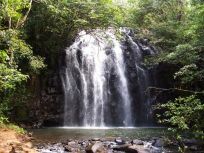 Malanda Falls Conservation Park offers abundant rainforest wildlife and walking trails, and a swimming pool at the foot of the falls. This is one of the best places in the world to spot the unique Lumholtz’s Tree-kangaroo, and though they can be difficult to spot, many visitors are rewarded with a sighting. Two easy walks meander through the rainforest, and maps can be picked up from the Visitor Centre. Early in the morning and later in the afternoon are the best times to go birding, but tree-kangaroos are just as easily seen during the day. 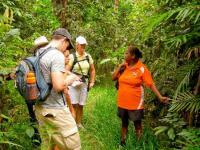 For anyone interested in learning about indigenous culture, Rainforest Dreaming Guided Walks are a must. Take a walk with a local Ngadjon Aboriginal guide through the Malanda Falls rainforests, and see the forest through the eyes of the local Ngadjon people. A deep, cylindrical volcanic pipe with a lake at the bottom is an awe inspiring feature of Mount Hypipamee National Park. A platform at the end of a 400m walking track through the rainforest provides an uninterrupted view of the remaining crater. A remarkable variety of vegetation types, including high-altitude rainforest, grow in this small park which is home to a remarkable diversity of possums. 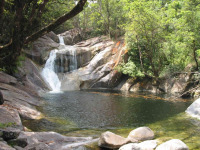 Whilst at Mount Hypipamee National Park take the walking track that will lead you to Dinner Falls. Dinner Falls is a series of three waterfalls each with their own distinctive character and shape. 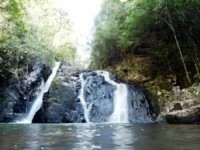 These Falls become the Barron River which flows into the ocean at Cairns. Enjoy a swim and picnic in the various swimming holes along the way. Hasties Swamp is a large seasonal wetland renowned for its diverse range of resident and migratory birds. Located on the transition zone between the rainforest (which once covered land to the east of the park), and the dry sclerophyll woodland which persists on the lower slopes of the Great Dividing and Herberton ranges, immediately to the south and west of the park. The best time for birdwatching is during 'the dry' (April to October) as the swamp dries out and the area becomes an important refuge for waterbirds. Up to 1500 magpie geese may be seen at one time. The Danbulla forest is a spectacular part of the Atherton Tableland, covering 12,000 ha between the Tinaroo and Lamb ranges. It includes eucalypt and acacia forests, pine plantations and Wet Tropics World Heritage rainforest. Crater lakes, huge strangler figs, rainforest walks, lakeside camping areas and places of important local history are some of the interesting features which make it a popular recreation spot for both locals and visitors. 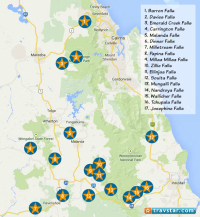 There are over 150 managed walks in the Wet Tropics Region. You can experience cool shaded walks under the rainforests canopy, wander around a peaceful lake, enjoy a stroll along a mangrove boardwalk, climb a mountain, visit a spectacular lookout or simply go for a beach walk. 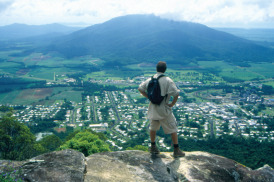 Visit the Wet Tropics website for a full detailed list of spectacular walks in the region. Lake Eacham is a beautiful clear, blue lake surrounded by cool rainforest, and a popular recreation area with locals and visitors. 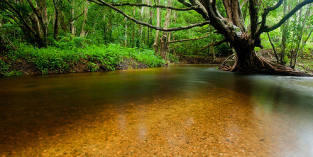 Popular activities include swimming, birdwatching, canoeing, picnicing and rainforest walks. The Lake circuit track is 3km return and offers secluded forest-fringed views of the lake and excellent opportunities for viewing wildlife. 14. The most photographed waterfalls in Australia! Millaa Millaa Falls are magnificent waterfalls surrounded by lush rainforest located on the Waterfalls Circuit, along with Zillie and Ellinjaa Falls. The falls cascade perfectly to a pristine waterhole below where you can enjoy a refreshing swim in the cool water. Millaa Millaa Falls are one of the most photographed in all of Australia, so make sure you bring your camera! Ellinjaa Falls are picturesque falls that are part of the Waterfalls Circuit along with Millaa Millaa and Zillie Falls. There's a 200 metre zig zag track to the base of the falls where turtles and platypus are often spotted. The falls are a great spot for swimming. There's also a little ledge hidden behind the falls that you can sit on and take in the scenery. Zillie falls are located 7.5km from Millaa Millaa falls on the waterfalls circuit.A short walk across the road takes you through rainforest to the viewing platform that provides a wonderful view of the cascading waters, as well as plenty of room to enjoy a picnic lunch or just relax and take in the surroundings. Souita Falls is located inbetween Ravenshoe and Millaa Millaa along Middlebrook Rd. This delightful scenic route winds its way through stunning country side with rolling green hills patchworked with pockets of rainforest. A rocky staircase descends to two separate sets of waterfalls and rapids pounding down the creek bed. Pepina Falls is located at Middlebrook Creek. 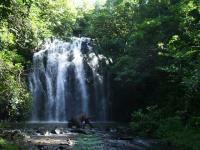 A 90m walk reaches the bottom of the falls with a small plunge pool amongst lush rainforest. Platypus inhabit these creeks so keep an eye out. 18. Spot Platypus, tree kangaroos and more! The Peterson Creek Walking Track is a haven for wildlife. Located in Yungaburra, this delightful walk is a fine example of regeneration of the native forest for over 15 years. Platypus, tree kangaroos, wallabies and a variety of birds and other wildlife are regularly observed. Many of the trees have name plates and there is interpretative signage along the way along with some great spots for a picnic. The Canopy Treehouses is a unique Australian accommodation and wildlife experience. Set in 100 acres of ancient rainforest located on the Cairns Highlands, you will find six luxury timber and glass Treehouses perched high in the rainforest canopy on the banks of the Ithaca River. In a world of rapidly shrinking ecosystems this protected 100 acres of rare upland complex mesophyll vine forest is part of one of the largest untouched tracts of rainforest on the Cairns Highlands and offers a phenomenally high density of rare and unique wildlife. This special experience is strictly for the private use of in house guests. A short drive from Ravenshoe is the Tully Gorge lookout. The most spectacular time to visit this area is just after some typical North Queensland rain. Walls of raw rock and rainforest plunge 300 metres (984 feet) down to the Tully River. An 800 metre track takes walkers to the Tully Gorge lookout where spectacular views of the deep gorge and Tully River can be enjoyed. Come and explore some of the most pristine and adventurous trails of the Atherton Tablelands with Tableland Adventure Guides. 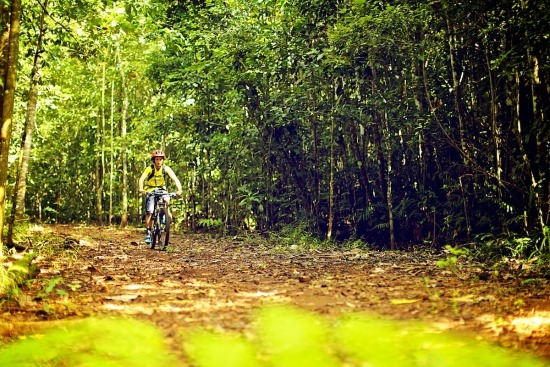 Join the Danbulla Rainforest Adventure Ride and experience the amazing Cathedral Fig tree, Crater lakes Mobo and Euramo and cycle under shady rainforest canopy. There are opportunities for a swim in Lake Tinaroo and associated creeks. 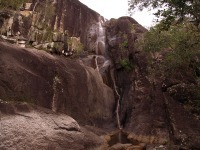 Mungalli Falls is the highest waterfall on the Tablelands. It is a 15 minute walk from the top of the falls to the bottom. There are swimming holes above and below the falls. Situated 13km from Millaa Millaa along the Palmerston Highway, towards Innisfail at Junction Road. Follow the signs left to Mungalli Falls. For a special getaway spend the night in a boutique timber treehouse set in tropical rainforest at Rose Gums. Explore 9 kilometres of rainforest walking trails and rainforest creeks, a charming waterfall and reforestation plots where 25,000 native rainforest trees have been planted since 1995. From Babinda in the north to Cardwell in the south, this stretch of the north Queensland coastline encompasses the townships of Miriwinni, Innisfail, Mena Creek, Kurrimine Beach, Mission Beach and Tully. This is one of the wettest areas in Australia, and consequently, it is also the greenest. 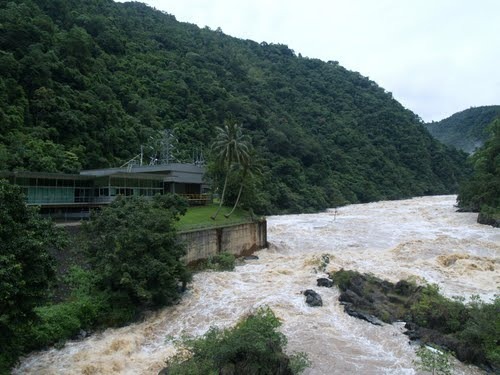 The high rainfall means that the rainforests are lush in the true sense of wet tropics, with cool mountain streams, thunderous rivers and spectacular beaches, it is a must-see for nature lovers! Josephine Falls is a tiered cascade waterfall, fed by rains falling on Queensland’s highest peak, Bartle Frere. The waters of Josephine Creek tumble over granite boulders, forming the picturesque Josephine Falls. A walking track leads winds through lush tropical rainforest, to viewing decks overlooking Josephine Creek and falls. Viewing platforms offer excellent views and opportunities for photography. 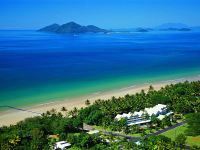 Etty Bay is known as one of North Queensland's most scenic beaches, popular for surfing, swimming, sailing, boating and fishing. This quiet bay is surrounded by lush rainforest and frequented by the the endangered cassowary. Quite often you will see the Southern Cassowary and chicks roaming the beach, wet tropic rainforest and nearby caravan park. A beautiful little beachside town, Mission Beach stands between two World Heritage areas, The Great Barrier Reef and Wet Tropics Rainforest. Mission Beach comprises of four villages: South Mission Beach, Wongaling Beach, North Mission Beach and Bingil Bay. 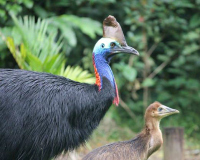 Home to many wildlife species, most notably the cassowary, there are a number of rainforest walks in the area to capture a sighting of them up close. 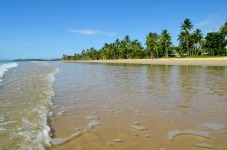 Dunk Island is a beautiful rainforest island located just off the coast of Mission Beach. Most of the island is national park, and the tropical verge of Dunk Island is wonderful for cool rainforest walks of which there are many. A climb to the summit at Mount Kootaloo, the highest point on the island, will reward you with stunning views. Cyclone-damaged rainforest on the lower slopes allows glimpses over the island and reefs as the track ascends. On the upper slopes, the forest opens out and eucalypts emerge through the canopy. The C4 Environmental Centre, located in Mission Beach, aims to protect Mission Beach's natural values by providing funds for conservation activities and education. Mission Beach is one of the most important remaining homes of the endangered cassowary. Learn more about this giant bird through displays, videos and environmental information. C4 sells native plants and a wide range of environmental books, postcards, t-shirts, and children's games. Licuala State Forest at Mission Beach boasts several enjoyable walking tracks, with a popular one being the Fan Palm Walk. The Licuala Fan Palm is native to the area and has the majority of the fan palm trees in all of Australia. This 1.2km loop track is an easy 20 minute walk. Impact of Cyclone Yasi — fallen trees and sawn-off trunks — is most evident here. 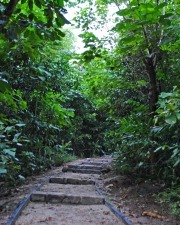 Located within the Licuala State Forest, the Children’s walk is approximately 350 metres. This short loop takes children on a discovery walk through the fan palm forest, following ‘cassowary footprints’ to a ‘nest’.You may see the rare Cassowary, the famous iridescent blue Ulysses Butterfly, Green Tree Frog, Scrub Turkeys or Wallabies along the way. This walk is best appreciated when walked in an anti-clockwise direction. Follow the Lacey Creek walk through the rainforest along, and across, the crystal clear creek. Signs along the track provide information about the evolution of various plants and animals. A viewing platform allows walkers to peer into a calm pool of Lacey Creek and spot saw-shelled turtles and fish. At the end of your walk, take a dip in the beautiful fresh water stream to cool off. This popular coastal trail is an enjoyable and picturesque 7km (return) route that includes beach and forest walking as well as island views. The track cuts through a wide variety of coastal rainforests to get to beaches and rocky headlands. It offers great views of the Family Group of Islands and the chance to see cassowaries, wallabies and other rainforest animals. The track takes about 3 to 4 hours to complete but is definitely worth it! This track is popular with mountain-bike riders and is the only track in Djiru National Park where bicycles are permitted. It follows an old forestry road used in the 1960s and 1970s to haul timber from South Mission Beach to the El Arish timber mill. The track heads north from the car park at the Licuala day-use area and exits on to the El Arish–Mission Beach road about 2km east of the Lacey Creek day-use area. Mission Beach Bike Hire specialises in hire equipment from heavy duty mountain bikes to beach cruisers. Clump Mountain National Park is 4.6 km north of Mission Beach and contains some of the few remaining patches of undisturbed tropical lowland rainforest in North Queensland. Bicton Hill is the main feature of Clump Mountain National Park. A circuit walking track up this moderately steep hill offers visitors spectacular mainland and island views, and a chance to see rare rainforest plants and the elusive cassowary. The Cutten Brothers Walking Track commemorates some intrepid settlers who made their living from timber in the early 1900s. The track travels through beautiful remnant coastal rainforest and offers spectacular glimpses of Boat Bay. Look out for cassowaries and a wide variety of rainforest birds inhabiting this area. At its northern end the track follows the beach before entering coastal rainforest. At its southern end, it emerges from rainforest at the Clump Point Boat Ramp Rd to meet the Ulysses Link Walking Trail. 13. Australia's No. 1 Rafting Adventure! 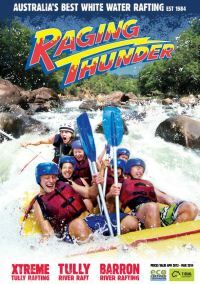 The Tully River rafting adventure is one of Australia's most popular rafting excursions, that winds through World Heritage Rainforest and offers rapids up to grade 4. The release of water into the Tully River is controlled by a hydro electric dam so the water levels are guaranteed all year round. Each raft is controlled by a highly trained river guide, who will provide all tuition, and share with you the history and wonders of this magnificent landscape only a few get to see. 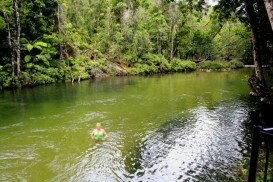 Alligators Nest, in Tully Gorge National Park is a great spot for a refreshing swim. A large swimming platform provides easy access to the crystal clear waters of this rainforest stream. This popular day use area features a the large, grassy area beside the creek has a swimming platform, picnic tables, toilets, gas barbecue and shelter. Named after the local scout group ‘The Alligators’ that used to meet there shed. Beginning at the eastern end of the Tully Gorge camping area, this wheelchair-accessible walk takes visitors through tropical rainforest. The area is noted for its butterflies, which are best seen between September and February. Climb the very steep and challenging Mount Tyson track to the 678 metre summit of Mount Tyson. 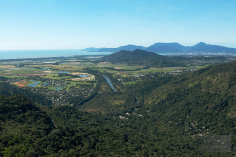 The trail takes you into the rainforest and once you have reached the top enjoy views of the Tully township, coastline and Hinchinbrook Island from the lookout. Murray Falls is one of the prettiest waterfalls in north Queensland, with spectacular water-sculpted rocks and crystal clear pools.The day-use area is a great location for a picnic. The falls can be viewed from the boardwalk and viewing platform. For the more adventurous, a walking track through the rainforest will take you to a lookout, with views of the falls and the Murray Valley. Hinchinbrook Island is one of Australia's largest island national parks (39,900 ha).This rugged island has cloud-covered mountains, fragile heath vegetation, lush rainforest, tall eucalypt forest and mangrove fringes. The Thorsborne Trail (3day/4night) explores the eastern side of the island through a tropical wilderness, along spectacular ocean beaches and crosses numerous crystal clear mountain streams. Located 51km south-west of Ingham, Wallaman Falls is the highest, permanent, single-drop waterfall in Australia. Boasting spectacular scenery, the main lookout at Wallaman Falls provides a view of Stony Creek as it plunges 268 m in a clear single-drop, often through a rainbow-fringed cloud of mist. 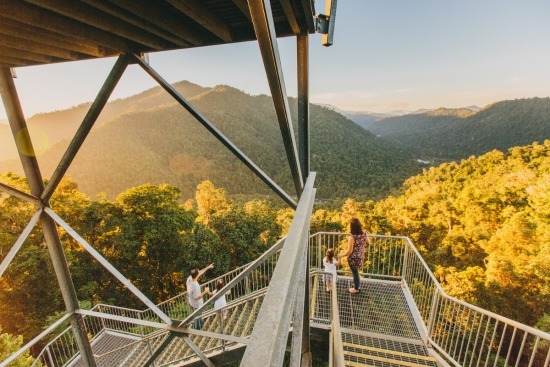 A second lookout provides stunning views of the gorge and the Herbert River Valley. 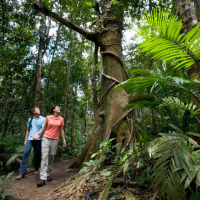 The Wet Tropics Great Walk is located in Girringun National Park and is 100 kilometres long traversing the Wet Tropics of Queensland World Heritage Area. The walk begins at the breathtaking Wallaman Falls, the largest single-drop waterfall in Australia. 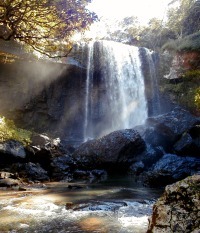 The four to six day walk from Yamanie to Blencoe Falls offers a true wilderness adventure. Part of the walk follows the awe-inspiring, 60 kilometre long Herbert River Gorge. The Cardwell Rainforest & Reef Visitor Information Centre is an accredited Wet Tropics Visitor Information Centre facility providing information about Cardwell, Hinchinbrook Island and Channel and environs. View sculptural displays, video presentations and have a chat with a delightful talking eel. The Cardwell Forest Drive is a is a must-do drive where you can discover delights such as beautiful water holes, a natural spa pool, forest and delightful picnic areas. This 26 km scenic drive starts at the town centre and is easy to follow with signs marking the way to Cardwell Lookout, Attie Creek Falls, Dead Horse Creek and Spa Pool. Spirit of the Rainforest Tour with Ingan Tours takes you deep into the mountainous region of the Tully Valley to the beautiful Echo Creek Falls. Aboriginal guides will interpret the rainforest environment and allow you to view the rainforest environment through their eyes along an Aboriginal trading route that served as an essential resource to sustain life for their people. The Misty Mountains Rainforest Retreat is a luxury resort for couples set at the base of Mount Bellenden Ker. Bellenden Ker is a region of diverse landscapes, numerous waterfalls and over 40 scenic drives. From the retreat you can explore the rainforest with its streams and springs by foot, bike or in an eco-friendly club buggy. Breakfast by the creek, swim in the stream or for the adventurous hike to the top of Mt Bellenden Ker. 25. Take a ride on the wild side! 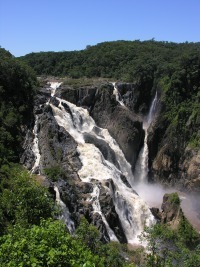 Enjoy views over the gorge and spectacular Barron Falls with a 250m drop into the river. 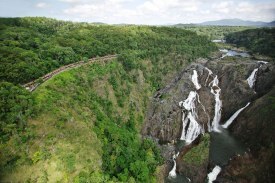 From the Barron Falls (Din Din) Lookout, watch the gondolas on the Skyrail Rainforest Cableway glide above the far-side of the gorge and, twice each day, watch the Kuranda Scenic Railway tourist train pull into the platform below. Davies Creek Falls is located in the Davies Creek National Park and is a magnificent waterfall that cascades over huge granite boulders. A marked trail leads to two lookouts. One provides a view back along the valley whilst the other overlooks Davies Creek Falls as it plunges 75m into the valley below. 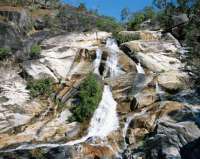 Emerald creek has a series of cascading waterfalls over granite boulders. A walking track takes you alongside the creek to the numerous falls and lagoons, up to the lookout with views of the valley towards Mareeba. The site is an ideal picnic spot and has several great swimming holes. Carrington Falls is stunning landmark in the Herberton Range, which comes alive during the wet season. To get to Carrington Falls, park down in an old quarry, hike up an unmaintained track, and then along the disused rail tracks for a while. The falls is on both sides of the track, running under it where the tracks cross. 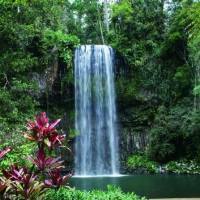 Situated in Malanda township, the Malanda Falls is a cascade waterfall on the North Johnstone River. The falls are a very popular swimming spot for residents of the area, and an important historical site to the local Aboriginal people. 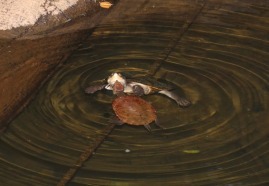 Look for platypus, fish and turtles from the viewing deck over the river. The Dinner Falls is a mix of three waterfalls on the upper Barron River near the Mount Hypipamee Crater.The bottommost of the waterfall series is a long cascade fall; the middle section of the falls is a trio of segmented drops; while the uppermost section of the falls has a triangular shape as it plunges off the tableland plateau. 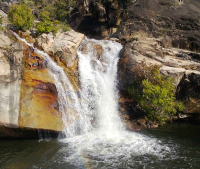 Big Millstream Falls is 3.5 km south-west of Ravenshoe and reputedly the widest single-drop falls in Australia. This park is rich in World War II history. A separate entrance to the park leads to Little Millstream Falls. View these beautiful falls from just near the car park or take the steep and narrow track to their base. Pepina Falls (also referred to as Papina Falls) is located immediately where Old Palmerston Road crosses Middlebrook Creek, 11km from Millaa Millaa, this small but scenic waterfall is tucked away behind a short and steep overgrown trail.The pathway leads towards the bed of Middlebrook Creek with partial views of the diminutive falls. 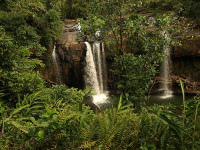 Millaa Millaa Falls is the most scenic of all the Tableland waterfalls. This plunge waterfall is surrounded by lush rainforest. The falls cascade perfectly to a pristine waterhole below where you can enjoy a refreshing swim in the cool water. Capture the best photos between noon and 2pm. This fall is best seen from below. There is a walking track to the creek bed with a lovely viewing platform at the base of the falls where you can enjoy a view of the cascading water and rapids. A colony of Flying Foxes are often spotted near the car park, so keep your eyes out! Ellinjaa Falls is a picturesque and popular waterfall that runs in cascades over a series of lava columns.There's a 200 metre walkway to the base of the falls where turtles and platypus are often spotted. The falls are a great spot for swimming. There's also a little ledge hidden behind the falls that you can sit on and take in the scenery. 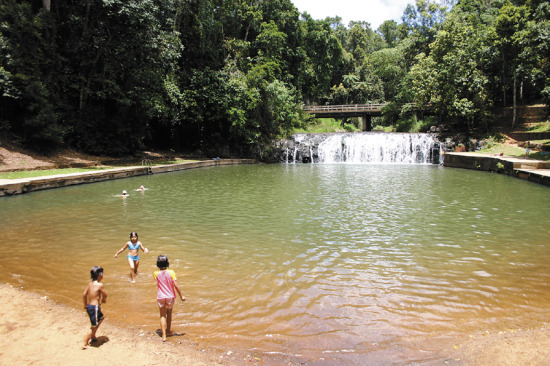 Located 4.9km along Middlebrook Road, Souita Falls is one of the more obscure waterfalls, less visited due to its location in a quieter area of the Atherton Tablelands. 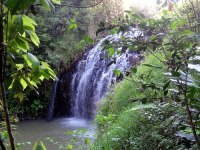 Souita Falls is a pair of small waterfalls within close proximity of each other. There is a 220 metre walking track with well constructed steps to two falls. 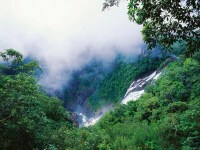 Situated in part of the Mungalli Falls Outdoor Education Centre, this is one of the highest waterfalls on the Tableland that runs over 3 steps to form picturesque cascades. The middle drop is the longest one with cumulative drop of 90m over the three tiers. The easy walk down to the falls takes about 10 minutes and youi can swim in the rock pools at the top and bottom of the falls. Nandroya Falls is a spectacular waterfall that you will need to earn its visit as it is a 2-3 hour circuit walk, but well worth the adventure! This walk is in Wooroonooran National Park near Henrietta Creek Campground, 25km from Millaa Millaa. At the falls, a 40m plume of water plunges into a pool below a semicircular cliff face, then flows over a secondary set of falls into a deep swimming hole. Wallicher Falls, though relatively small, are spectacular. Located off the Palmerston Highway, between Millaa Millaa and Innisfail, it’s about a 500 metre walk along the trailhead to Wallicher Falls. Access to the bottom of the falls can be gained after crossing Henrietta Creek. Approx 10m tall, the falls are far wider than tall. Located on the same trailhead as Wallicher Falls, reach the Y-junction and take the pathway to the right for Tchupala Falls. Tchupala Falls is known as a segmented waterfall as the cascading water from Henrietta Creek spills over the basalt rocks in individual but distinct waterfalls, creating more than one waterfall. It's a pretty waterfall but many say Wallicher Falls is more spectacular. Josephine Falls is located 75 km south of Cairns in the Wooroonooran National Park.This tiered cascade waterfall on the Josephine Creek is fed by rains falling on Queensland's highest peak, Bartle Frere.From the car park the track leads you through lush tropical rainforest, to viewing decks overlooking Josephine Creek and falls.This is also a popular recreation site as the water flows over a large rock to form a natural waterslide on Josephine Creek. Cascading waterfalls are a stand-out attraction on the Atherton Tablelands, and easily accessible for self drivers. Download the map and plan out your waterfalls trip. 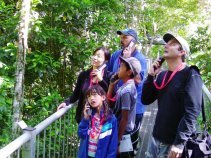 Located just 10kms north of the Daintree River Ferry, this award-winning world class interpretive facility that allows visitors easy access to every level of the Daintree Rainforest. Cruise along sections of the spectacular Daintree River. 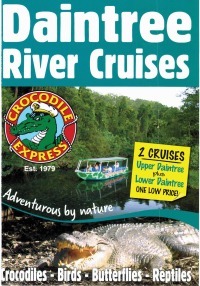 Each passenger is offered a "Croc Pass" to travel unlimited on any of the Crocodile Express cruises over a three day period. Explore the World Heritage Daintree National Park and Cape Tribulation on a full day or overnight tour with The Adventure Company. Take a walk through the world's oldest rainforest to wine, dine and be entertained by candlelight. For those with an adventurous spirit, view the rainforest from a unique perspective, flying through the trees on flying fox ziplines. The only horse riding available in the Cape Tribulation area we cater for beginners, intermediate and experienced riders. Billy Tea Bush Safaris are the longest established four wheel drive day tour operator to Cape Tribulation. Their company prides itself on its informative tours. Authentic timber carriages transport you between Cairns and the pretty village of Kuranda, via hand-hewn tunnels and across towering bridges, through the awe-inspiring Barron Gorge. Skyrail Cableway runs over the rainforest and gorges from Caravonica Lakes to Kuranda, a distance of 7.5km, with 2 mid-route stations. Rainforestation is a unique tourist attraction is situated five minutes travel from Kuranda Village and hosts Army Duck Rainforest Tours, Pamagirri Aboriginal Experience and Kuranda's largest Koala & Wildlife Park. Regarded as the best rafting across Australia and New Zealand, the mightly Tully River is surrounded by world heritage rainforest. Spend over 5 action-packed hours rafting 45 rapids. Tour with Northern Experience south of Cairns for a full day out travelling through the magnificent World Heritage Wet Tropics rainforests of Wooroonooran National Park. Green Island is the only coral cay on the Great Barrier Reef with a rainforest growing on it! Spend the day exploring native plants, colourful bird life, coral gardens and abundant marine life. 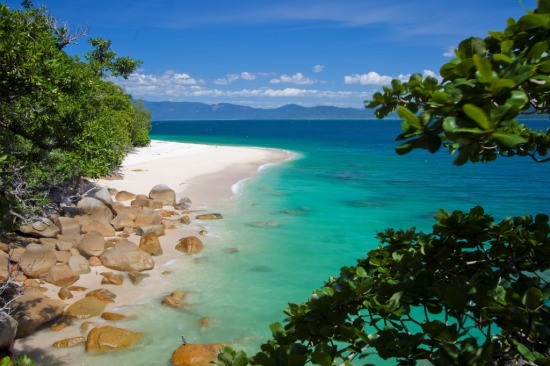 Fitzroy Island is a national park covered with lush, pristine rainforest. There are hiking trails and guided walks as well as numerous water sports options available. A cultural experience with the Rainforest Aboriginal People from the Davidson Valley region situated halfway between the cities of Cairns and Townsville and only 45 minutes south-west of Mission Beach.